I saw a used Lyman M die for sale. It’s not a caliber I reload, but was wondering if you could buy the internal part for different cartridges, or if you have to buy a complete die for each? The expander spud is threaded. Lyman does or used to sell them. I have had custom ones made for specific boolits. I find the factory ones undersized and not the best for softer cast boolits. That said, Do you have any M dies? If not, you might consider the NOE expanders before going down the M die rabbit hole. A Lee universal flaring die and you use the NOE expanders that Al makes in custom sizes for a tailored fit for your application. Just a suggestion. BTW, I have about a dozen Mdies with 8 or 10 custom expander spuds. Actually I do use the NOE expander dies. They work great. I checked the Lyman site and it didn’t mention anything about buying just the inside part. Also, they don’t seem to have that much of a selection. No .45-70 dies. I went down the M die rabbit hole. It would have been if not cheaper, more simple to have done as Brad suggested and started with the NOE stuff. A nice plastic box with divided and labeled trays and I'd have everything for expanding all calibers right there. Not all of my M dies are undersized but my 44 and 45 caliber are. The 45 being slightly undersized is not a problem as I use it for 454 Casull brass and want those bullets tight. Track of the Wolf Expander Plugs ... Use neck expander plug in #LEE-DIE-45-EX die body, with standard 7/8-14 threads, in your reloading press. There are two M die bodies, one is shorter than the other. They both use the same plugs. I have a full complement of them that I should sell off. The NOE setup is more versatile and provides better neck tension w/ cast bullets. 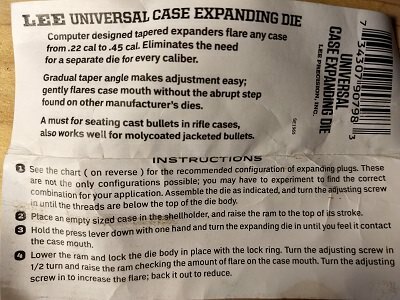 When I first started loading cast bullets, I had never heard of NOE expanders. So, I bought M-dies. I got one for .38/.357 and one for .45c. When I started casting and loading for 9mm, the only thing that was big enough for the oversized bullets were the Noe expanders. The M-dies work fine as I load .358 in my .38/.357 and .452 in my .45c, but the NOE expanders give you many more options. If I was starting from scratch, it would be all NOE without a doubt, but you live and learn. Just like buying new tools, and who doesn’t like buying new tools. NOE expanders are great and I am getting ready to order more to have more options. I haven’t figured out how to use the Lee plugs to take up the right amount of space in the die. I have a fair amount of play before the plug stops moving in the die and does it’s job. One Lee plug doesn’t take up enough space and with two I can’t start the threads of the screw cap. I guess I have to make my own spacer. Not the end of the world. 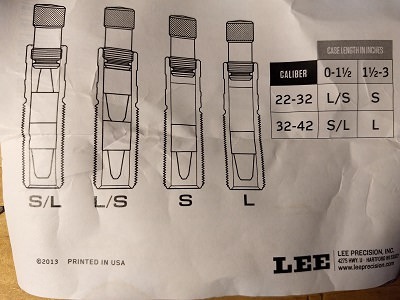 There is a little chart that comes with the lee die. It tells you how to arrange them. For some calibers you have to flip the lee inserts over. It worked for me anyway. Good luck! I first bought a Lee expander and it worked fine as explained in the instructions. I then bought expander plugs from NOE that are to be used in the Lee expander. It’s with these new plugs that I can’t seem to get the right spacing. Me too. The NOE plug clanks back & forth, but it does the job. Don't understand you guys problem with the NOE buttons in the LEE expander die. Every one I have works perfectly. You can align the LEE expanders any way you want to get the desired length you need.You can use them flat side up or tapered side up to go up into the adjustment knob to get any length you desire. Greg What cartridge are you having trouble with? For the most part, at the moment, I am loading .45-70 405 and 500grs. I have the same problem with my 6.5mm too. One Lee expander plug, with the NOE plug, doesn’t take up enough room, so there is play until it makes firm contact. If I put both Lee expander plugs in, with the Noe plug I can’t get the top cap to engage the threads. It’s not a big problem. It does work, but I would like to have a smoother and more direct contact. I think it can easily be solved by cutting off a piece of round stock or even a bolt to a length equal to one and a half times one of the Lee plugs. However, since it does work the way it is, I haven’t gotten around to making something up. It would be nice if NOE had the right one all ready to go for a couple of bucks extra. I know I would have gone for it. I've been using LYMAN M- Dies my whole life. All bought long before LYMAN was driven into the toilet by corporate *******s. They work FANTASTICALLY. But you gotta get the old stock. From back in the days when there were different size expanders for .44spl/44mag & .44Wcf. And 45acp & 45Colt. I see in the latest issue of HANDLOADER Mag that someone is making M-type die inserts for the Dillon expander powder die. I make custom M die expanders in my lathe, starting with 9/16 - 18 threaded rod from McMaster-Carr. About $5.00 a foot in 1 foot in 3 foot lengths Part # 92580A125. Cuts and polishes beautifully. You get about 4 expanders per foot. More if you only make short ones. I just ordered another plug only (6.5) from Lyman today, it was 7 dollars and some odd cents. The lady was very nice and I already had the part number from the folks on this forum. She told me they are running a promotion of free shipping for a couple of weeks which was a nice surprise. I think there are three body sizes, 22 Hornet, short, and long. Or at least my Hornet is shorter than my shorts. I like the M dies for jacketed bullets as I quit using the expander balls years ago. NOE is a great way to find out about the right expander size, I always buy a few +/- 001. I even use different (larger) expander on some new brass (458 Socom etc). Loaded a few times,a thou smaller gives the same tension. Having said that,I just got a nice,solid Lyman M-die,a 38 spc for my 9mm cast.